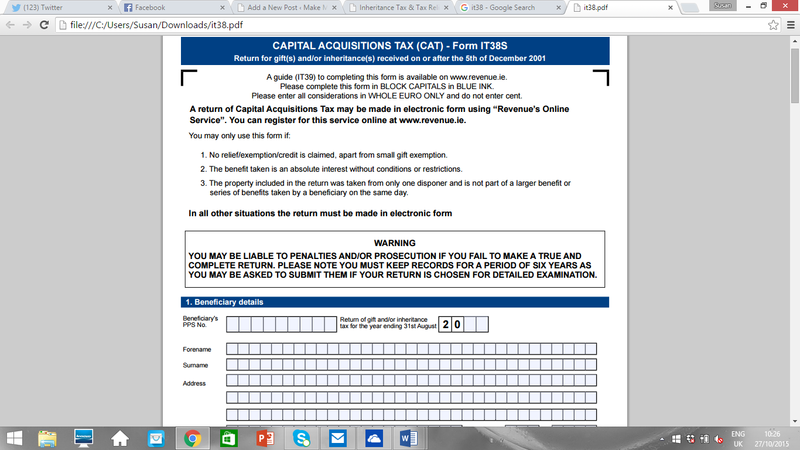 Do I have to pay tax on the Gift/Inheritance I received? If you received a gift of €3,000 or lower during the year from anyone, you are entitled to a Small Gift Exemption and there is no requirement to file a return. 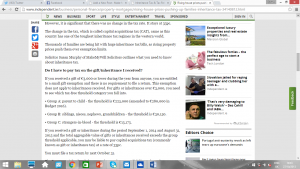 This Small Gift Exemption does not apply to inheritances received. 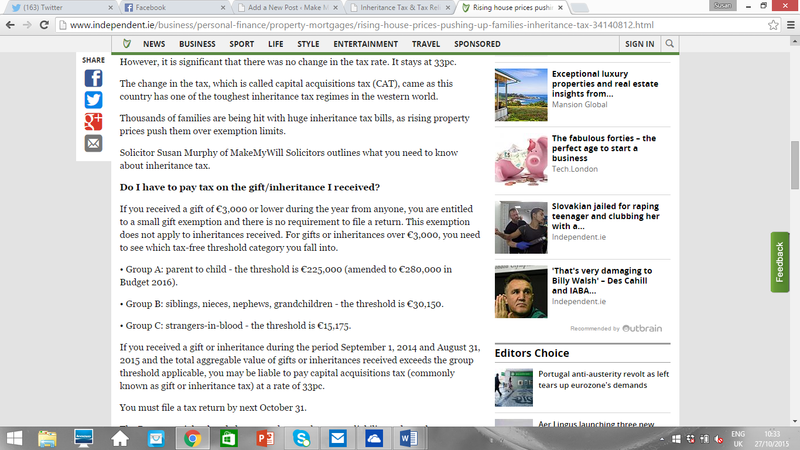 For gifts or inheritances over €3,000, you need to see which Tax Free Threshold Category you fall into. 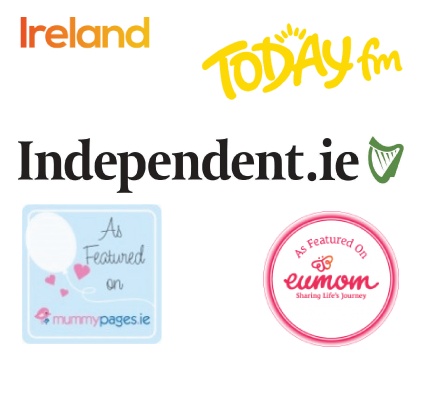 If you received a gift or inheritance during the period 1st September 2014 and 31st August 2015 and the total aggregable value of gifts or inheritances received within the same Group Category since 5th December 1991 exceeds the Group Threshold applicable, you may be liable to pay Capital Acquisitions Tax (commonly known as Gift or Inheritance Tax) at a rate of 33%, and must file a Tax Return by 31st October 2015. The Revenue might already be aware that you have a tax liability and may have sent you a personalised IT38 Form (A Gift/Inheritance Tax Return Form). However even if you did not receive an IT38 Form from Revenue, the obligation to submit a Tax Return rests with you, the beneficiary; this is a Self-Assessment Return. The property must be farmed on a commercial basis with a view to making a profit. If you are receiving a gift or inheritance of “relevant business property”, you may qualify for business relief. Business is defined as one which is carried on for gain, and it includes the exercise of a profession or location as well as a trade. “Relevant business property” is defined by Revenue as “the business or an interest in the business in the case of a business carried on by a sole trader or by a partnership.” Certain types of businesses are excluded from this relief, for example businesses dealing wholly or mainly in currencies and securities. The relevant business property must have been owned by the disponer (the person giving the gift or inheritance) for a continuous 5 year period prior to the date of the gift, or a 2 year period in the case of an inheritance. Similar to agricultural relief, if you qualify for business relief the value of the business property you are receiving is reduced by 90% for tax purposes. If an uncle or aunt has given you their business, you may fall into the Group A Category where the tax free threshold is €225,000 (amended to €280,000 in Budget 2016) provided you have worked for him or her substantially on a full time basis for the 5 years immediately preceding the gift or inheritance. This relief only applies to assets used in connection with the business. Other tax exemptions include Heritage Property Exemption, Exemption in relation to Retirement Benefits, and Exemption of certain transfers following a marriage dissolution. For more information on exemptions you can visit the Revenue website at www.revenue.ie or contact Susan Murphy at MakeMyWill Solicitors. The tax reliefs and exemptions mentioned above may be withdrawn in certain circumstances. For example, where you qualify for dwelling-house relief, you must continue to occupy the property for a further 6 years. Likewise if you qualify for agricultural relief or business relief and sell the property within 6 years of the date of the gift or inheritance, the tax relief will be clawed back. 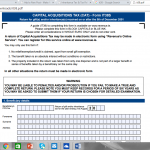 How do I file a Gift/Inheritance Tax Return? Most tax returns are now filed on-line through the Revenue’s ROS system, which is their preferred method. It can take up to two weeks to register for ROS, so if you are not yet registered it would be advisable to ask your solicitor or accountant to file the return on your behalf. You can only file a paper short form IT38 if you are getting the gift or inheritance from one person and it is not part of a series of benefits, if you are not claiming any relief or exemption, and if the gift or inheritance is not subject to any conditions. A surcharge applies for the late filing of a tax return, and the amount differs depending on how late the return is. If you file within 2 months of the deadline, the surcharge is 5% of the total tax payable, subject to a maximum fine of €12,695. If you file later than 2 months after the deadline, i.e. after 31st December, the rate increases to 10% subject to a maximum fine of €63,485.